The coast of south east Cornwall, which faces the English Channel, is far less rugged than the north coast and presents a much gentler and more sheltered landscape. The only city in the entire county of Cornwall, Truro stands amidst rolling green hills where the Kenwyn and Allen rivers combine to become the Truro River. Truro Cathedral was built at the turn of the nineteenth century in the Victorian Gothic Revival style and boasts two 250 feet towers and an elegant spire. The cathedral took thirty years to construct, from 1880 to 1910, and was built on the site of the old St. Mary's Church, consecrated over six hundred years earlier. The vibrant port of Falmouth is one of south east Cornwall's main resorts. The town possesses four extensive golden beaches, Gyllyngvase, Swanpool, Castle and Maenporth. The picturesque coastal village of Flushing lies at the foot of a steep hill, facing the bustling town of Falmouth across the Penryn River, an arm of the Carrick Roads. Known in Cornish as Nanskersys, which means valley of the reed swamp, the village was founded in 1661, Flushing acquired its name from Dutch engineers from Flushing (Vlissingen) in the Netherlands who built the three main quays in the village. 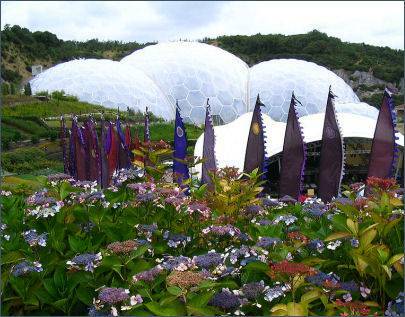 The Eden Project a large scale environmental complex, is located around 3 miles from the town of St. Austell it is one of the most popular visitor attractions in the country and provides an unforgettable experience in a stunning location. 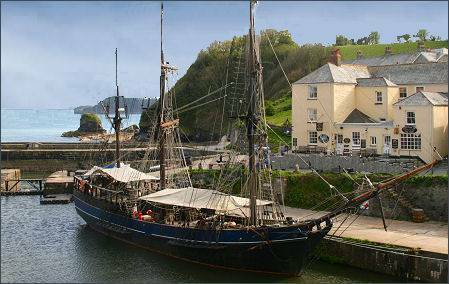 The picturesque port of Charlestown (pictured right) lies around 2 miles (3 km) to the south east of the town of St Austell. Charlestown was a Georgian 'new town' which developed from a small fishing village known as West Polmear.Charlestown has survived as a working port and a small amount of china clay is still exported. The port remains unspoiled and retains much of its Georgian character. Charlestown harbours a fleet of square riggers ships, there is generally at least one of these superb ships in the harbour. The equallly attractive Lost Gardens of Heligan, the seat of the influential Tremayne family for more than four hundred years, one of the largest restoration projects in Europe was begun in Cornwall in the spring of 1991. A neglected garden had been discovered beneath undergrowth and rubble near the fishing village of Mevagissey, where it had lay hidden since the final years of the First World War. The now fully restored gardens are set in a sheltered valley and warmed by the Gulf Stream, they contain many rare and exotic plants and cover eighty acres in all. Trebah and Trelissick Gardens are no less delightful, Trebah Garden is pleasantly situated around 4 miles to the south west of the town of Falmouth and covers about 26 acres. Trelissick Gardens at Feock, a few miles south of Truro, are set on the estuary of the River Fal. Feock itself is a pretty village situated about 5 miles (8 km) south of the town of Truro and lies at the head of Carrick Roads on the River Fal. Said to be one of the oldest gardens in Cornwall, tranquil Enys Garden, situated on the northern outskirts of the town of Penryn is a delightful 30 acre garden, features of interest include an open meadow known as Parc Lye (pictured left) , where the spring bluebells are spectacular, the flower garden, which is gradually being restored to its former glory, a New Zealand garden and many woodland areas. Cornwall's dramatic temperate rainforest garden, Tregrehan was created in early nineteenth centry by Carlyon family, concentrating on plants from warm temperate regions. The beautiful woodland garden is situated at Par, which lies about a mile to the east of St Austell and was listed as nationally outstanding on the English Heritage gardens register. 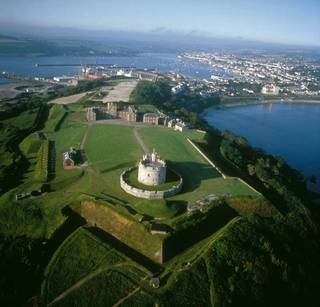 Pendennis Castle (left) occupies the headland of Pendennis Point and is now owned by English Heritage, it was built by King Henry VIII from 1540-1545, along with nearby St. Mawes Castle as a coastal defence at the entrance to the River Fal. The Iron Age hill fort of Castle Dore is situated near the town of Fowey was probably occupied from the fifth or fourth centuries BC until the first century BC. The fort consists of two ditches which surround a circular area measuring 79 metres (259 feet) in diameter. The fort overlooks the coastal floodplains of Par to the south west, and the path up from the River Fowey to the east. The inner ditch is circular in shape and measuring 79 metres (259 feet) in diameter internally, the outer ditch arced round it from the north to the south-east before widening in the north east to form an entrance. Both ramparts appear to have been constructed from material excavated from external ditches.The ramparts were made higher at a later date and now stand 8 ft 2 in high and from the entrance which was made more complex. The small but extremely characterful old fishing village of Polruan, known in Cornish as Porthruwan, is located at the mouth of the River Fowey, lying just across the river from the busy port of Fowey, the village is famed for its boat building heritage. East and West Looe, on Cornwall's south east coast are divided by a deep wooded river valley crossed by a seven arched bridge, which was built in 1853. Picturesque East Looe, which was granted its charter in 1237, is the larger and is an attractive little town. Bobbing fishing boats line its quay, the warehouses around the quay have been converted into holiday flats, restaurants and shops and boat trips are available to Mevagissey and Fowey.